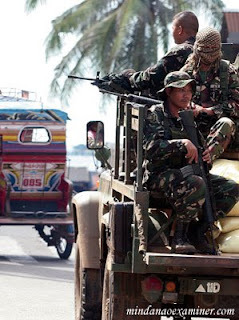 ZAMBOANGA CITY (Mindanao Examiner / Nov. 7, 2011) – Philippine troops are pursuing Abu Sayyaf militants tied blamed for a landmine blast that left a total of six soldiers wounded in the southern province of Basilan, officials said Sunday. Officials said Special Forces soldiers were running after Puruji Indama and Hasan Asnawi in the town of Sumisip, where six soldiers were wounded earlier in the day. More troops were sent to the area to hunt down the two notorious leaders, said Army Colonel Ramon Yogyog, commander of military forces in Basilan, one of five provinces under the Muslim autonomous region. There were no immediate reports of fresh clashes in the town, a known stronghold of Abu Sayyaf militants blamed for the spate of kidnappings and terrorism in Basilan and other parts of Mindanao Island.